Most individuals are aware that prolonged or frequent sun exposure can have a negative impact on health and appearance. However, there are still some misconceptions about skin cancer risks, prevention, screening, and treatment. Melanoma originates in melanocytes, which are pigment-producing cells, and occurs when the skin becomes damaged by ultra-violet rays. As a result, abnormal cells multiply at a rapid rate and form malignant tumors. While melanoma is not the most common form of skin cancer, it can be the deadliest if not detected or treated in the early stages. Cumulative sun exposure and a history of burns with blisters increase an individual’s chances of developing melanoma. Other risk factors include having 100 or more moles, a lighter skin type, a history of melanoma, or compromised immunity. Hereditary also play a significant role in melanoma. In fact, a patient’s risk increases by 50 percent if he/she has a first-degree relative with the disease. Shielding your face and body from the sun’s harmful ultra-violet rays is essential in melanoma prevention. Patients should make every effort to avoid tanning, burns, and UV tanning beds. Dermatologists recommend wearing protective clothing, a wide-brimmed hat, and daily broad-spectrum sunscreen with at least a 30 SPF. Sunscreen should be applied 30 minutes before going outside and every two hours thereafter. Seeking shade between the hours of 10:00 am and 4:00 pm is another way individuals can minimize photodamage. A monthly head-to-toe self-exam and yearly full body screening can help in the early detection of melanoma. Patients should inspect moles for any asymmetry, irregular borders, changing colors, diameter greater than an eraser head, and evolving appearance. Surgical excision of the melanoma, including a surrounding portion of healthy skin, is the first step in treatment. A sample of the tissue is then tested to determine if the “healthy margins” have any cancerous cells. Another option is Mohs Micrographic Surgery which removes tissue one layer at a time to be examined under a microscope for cancerous cells. Surgeons continue to excise layers until the margins are observed to be cancer-free. 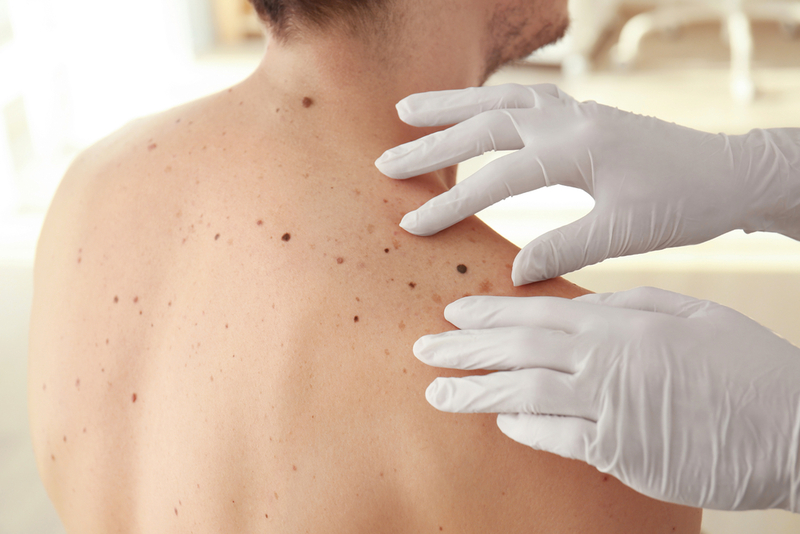 For additional information about skin cancer, melanoma or other clinical dermatology services, please call Hagerstown Dermatology & Skincare today to schedule an appointment.